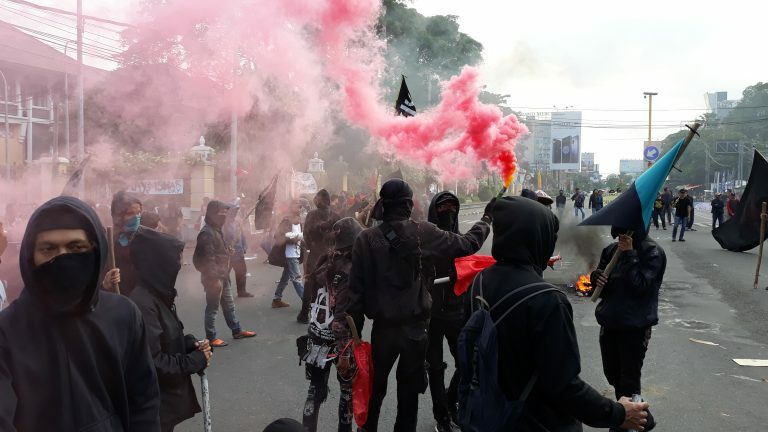 Anarchists in Indonesia are making their presence felt as a dangerous threat to the Indonesian state, capitalists, and monarchies. In the spirit of international solidarity, we reached out to an anarchist in Indonesia to discuss the history of anarchism there, anarchist involvement in the struggle against land grabbing and mega-projects throughout the country, and the guerrilla struggle against Indonesian colonialism in West Papua. We also spoke about the May Day rebellion and its aftermath in Yogyakarta. How did the 1965 anti-communist purge affect the left in Indonesia? In short, the 1965 anti-communist purge created a chilling effect on any sort of leftist organizing and anti-capitalist struggle. The Indonesian Communist Party was once one of the largest in Southeast Asia and possibly in the global south, but the massacres of communists, suspected communists, sympathizers, and the Chinese minority of Indonesia swiftly and abruptly ended any sort of left struggle for about thirty three years. While this is not to discount those who were active during the Suharto years, Indonesia in that time faced severe repression. Textbooks were censored, books banned, suspected sympathizers continued to be hauled away for questioning and the sheer amount of corruption and cronyism going on in all levels of government served to further intensify the great income inequality and the theft of resources from the people. However, this moment in Indonesian history, along with the earlier failed communist revolution in 1926, had shown the limits of what Marxism-Leninism could do in Indonesia. As a result, this made it less likely for leftist struggle to approach fighting capitalism from a socialist or communist point of view than from an anarchist one, which may explain the prominent role of anarchists of varying stripes in Indonesia today (anarchist-communists, syndicalists, egoists, etc.). When did the resurgence of anarchism begin in Indonesia, and what factors led to the revival of anti-capitalist organizing? Most would say that 1998 was when anarchists and anarchism came to the fore in Indonesia, but I have to admit it may have started earlier with the punk and metal scene in the 80s and early 90s. That being said, the overthrow of Suharto in ’98 was a key time when those of the older generation took to the streets and fought the military, police, and the government (like the three-headed hellhound). Increased access to information beyond the sanitized channels, whether it was illegal books bought under the table in pasars (local markets) or zines produced by local activists/musicians or the internet, played a role in the revival of anti-capitalist organizing and action. Of course, Indonesia being one of the places that is directly affected by the rapacious greed of capitalism in its twin forms of climate change and globalization, there was plenty of popular action against resource extracting multinationals like Freeport-McMoRan and palm oil companies in the early 2000s. Most of these early protestors and groups probably would not call themselves green anarchists or eco-anarchists but there was overlap and solidarity with other eco groups worldwide. These struggles continue today. How is privatization and land grabbing affecting poor residents in different cities of Indonesia and how are anarchists organizing against gentrification? In cities all over Indonesia it is common for the local government to seize residents’ lands through something similar to eminent domain law. Usually the justification is to develop infrastructure (toll roads, MRT, etc.) or high-income residential areas. There is very little actual public space in Indonesian cities and those that exist are mostly Privately Owned Public Spaces (POPS.) Thus residents are increasingly and continuously priced out of their own neighborhoods or have their own neighborhoods entirely bulldozed to make way for the latest mall/apartment combo. Anarchists in every city have been at the forefront of the struggle against land seizures and privatization. Efforts in Bandung include direct action against the machines themselves, preventing them from working and also community efforts to raise funds supporting displaced residents. Anarchists in every city have been at the forefront of the struggle against land seizures and privatization. Efforts in Bandung include direct action against the machines themselves, preventing them from working and also community efforts to raise funds supporting displaced residents. Further below there is the case in Yogyakarta with the new international airport. That being said, the specifics in other cities like Surabaya or Medan are unknown to me and one should best ask those directly involved in the fight. Can you discuss Indonesia’s colonial relationship with West Papua and the involvement of the United States and United Nations in ensuring this arrangement? Indonesia bases its claim to the western part of Papua on the national myth of the Majapahit Kingdom. While the history is accurate, in the sense that the Majapahit Kingdom did control lands that make up modern-day Indonesia, this really amounts to nothing more than an irredentist fantasy similar to the Greek Megali Idea or Greater Serbia or Greater Armenia. West Papua was the most eastern part of the Netherlands Indies and one of the few places that remained in Dutch control after World War II. Ostensibly Sukarno’s motives were that of decolonization when he supported an invasion of Dutch New Guinea, but whether or not he said this or that, the point remains that what happened to West Papua from 1963 on was nothing less than colonialism or imperialism. In 1961 an independent Republic of West Papua was declared and the Morning Star Flag was raised. In 1962 Dutch rule ended but by May the following year Indonesia had taken over. This came about due to the UN-ratified New York Agreement which transferred authority to Indonesia in all but name. From ’63-69, West Papua was under UN Temporary Executive Authority and in 1969 came the much-promised referendum. Known ominously as the “Act of Free Choice,” the referendum amounted to an overwhelming support by so-called community elders for West Papua to join Indonesia. Clearly controversial, even observers at the time noted that those who voted seemed to be under duress to vote Yes. Let us not forget the United States’ role in all this, which is most apparent in the infamous mining company Freeport-McMoRan. This US-based mining company owns the Grasberg mine in West Papua, just a short distance from Mount Jayawijaya. The mine has been in operation since 1967, when Suharto essentially signed away mining rights in Papua so long as he and his family gets theirs. As the largest gold mine and second largest copper mine in the world, the environmental impact of its operation is astronomical and satellite photos of desolate fields and rivers running red and black with pollution should shock anyone. Just like the Old West or the Belgian Congo, company towns are ubiquitous in West Papua and the largest of these, Tembagapura, is at the foot of the Grasberg mine. Workers are routinely subjected to long hours, live in cramped quarters, and some get paid with company scrip. This is of course not including the facts that entire villages are ousted from their homes, pollution rots the soil and kills crops, and it is increasing difficulty for natives to get clean groundwater. Recent years have shown little improvement of conditions for Papuans while the capital owners in Indonesia and the United States are getting fat off the profits. What kind of guerrilla struggle has been active in West Papua? Since the Act of Free Choice and possibly earlier, there has been efforts by Papuans within and outside the region to rid themselves of the tyranny of Jakarta. Known as the Free Papua Movement, it is more proper to say that it is an umbrella term for different groups and movements with varying goals. Organisasi Papua Merdeka’s actions include everything from solidarity protest abroad and local peaceful action, to outright sabotage and guerrilla warfare. Diversity of tactics is something they embrace. Just the other week, on the 27th of June during the regional elections in Indonesia, gunmen opened fire on a polling station in Papua. Earlier this year, Freeport vehicles were shot. Of course, the state and all its myriad apparati has clamped down on these movements. A recent Amnesty International report states that extrajudicial killings by the police and military over the last ten years have amounted to 95. Activists are routinely jailed and denied visiting rights or a fair trial. Any official complaint of police brutality or military excess are either dismissed outright or languished and forgotten by the justice system. Organisasi Papua Merdeka’s actions include everything from solidarity protest abroad and local peaceful action, to outright sabotage and guerrilla warfare. Diversity of tactics is something they embrace. Groups continue to operate in the Papua highlands and jungles, whether or not they are affiliated with OPM or other independence movements. An additional difficulty that Papuans face is the strict control Indonesia has over who is allowed to go to Papua and for what purpose. Journalists often get carefully curated itineraries to show off Potemkin villages so they can write puff pieces or they are denied travel outright. Foreign journalists also face extra scrutiny. As such, getting news out is tough and even dedicated online accounts have slowed in recent months. Nevertheless, on the ground struggle is still happening and it doesn’t look like the Papuans are giving up to the bastards any time soon. What is the context of the anti-feudalist march that happened on May Day in Yogyakarta? Why were people marching against feudalism and how does the feudal situation relate to the struggle against the new international airport in Yogyakarta? While Indonesia is, for the most part, a representative democracy, monarchies still exist all across the archipelago, foremost being the Sultanate of Yogyakarta. Due to an agreement between the Sultanate and the Indonesian revolutionaries during the independence struggle, the Sultan was allowed to keep his temporal powers over his territory equivalent to governor in other provinces. Thus, the old systems of power remain intact. Feudalism being a term defined more or less by one’s relation (and lack thereof) to land, it is a useful way to look at hierarchy in Yogyakarta’s context. The Sultan of Yogyakarta, Hamengkubuwono X, owns all of the land in the Special Administrative Region of Yogyakarta and all taxes and levies go to the royals. In a feudalistic sense, everyone merely leases the land in exchange for labor. As such, even if one lives in a particular area or neighborhood, the Sultan and by extension the government has the power to remove and resettle anyone in his holdings. This is precisely the case with the new Yogyakarta airport project in which residents have been forcibly removed in order to make way for the construction. Kampungs or shanty towns are routinely seen by the government and capital owners as disposable so in Yogyakarta and beyond, the most vulnerable population are targeted for forced evictions and relocations. Efforts to fight against the state and capitalists include direct action on construction machines and sabotage. Solidarity actions beyond Yogyakarta have included fundraisers and protests against PT Angkasa Pura, the company behind the airport. What took place during the May Day rebellion and what is the status of the anarchist prisoners in Yogyakarta? On May Day 2018, anarchists in Yogyakarta took to the streets to protest the Sultanate and the construction of the Yogyakarta airport project. At the March Against Feudalism, the call was out to “murder the Sultan!” and a police post was destroyed. 69 May Day participants were arrested and of those people 11 were considered suspects by police. Of those 11, 6 comrades were transferred to Cebongan Prison and 5 comrades were detained at Yogyakarta Regional Police Station. After months in detention, the anarchist prisoners were all released. On May Day 2018, anarchists in Yogyakarta took to the streets to protest the Sultanate and the construction of the Yogyakarta airport project. At the March Against Feudalism, the call was out to “murder the Sultan!” and a police post was destroyed. One case in particular involved the anarchist Brain Valentino (Ucil), who was beaten and tortured during interrogation without access to legal council, and was later hospitalized. He was the last anarchist prisoner to be freed on December 7. Any final thoughts about anarchy in Indonesia? I do not wish my words here to be taken as definitive nor to imply that I speak for anyone other than myself. Anarchists in Indonesia have come a long way since 1998 and are still fighting in the streets everyday. Shout outs to Palang Hitam Indonesia and any and all anarchists of all stripes in every city for fighting against the capitalist death machine leading us straight to Armageddon. New hoodies, t-shirts and other stuff in the Enough is Enough shop. Support our independent reporting an our work in the Enough is Enough Info-Café. Click here or click at the image below.